A campaign to stop flytipping is being launched across County Durham from today. 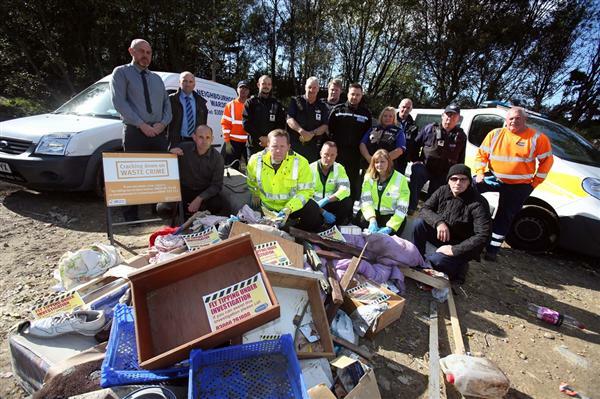 Operation Stop It is Durham County Council’s biggest ever crackdown on the illegal dumping of waste. The council is working in partnership with Durham Police, Crimestoppers and the Environment Agency to target flytippers and ensure householders understand their responsibilities in making sure their waste is disposed of properly. Flytipping is a serious offence which blights the environment, can pollute rivers and other waterways, endangers wildlife and is costly to clean up. As well as targeting those who illegally dump waste, Operation Stop It also aims to remind householders that they are legally responsible for ensuring that anyone they use to dispose of their household waste – including furniture, household appliances and building materials – is properly registered with the Environment Agency as a waste carrier. People can check whether a firm is registered online at www.gov.uk/find-registered-waste-carrier or by calling 03708 506 506. Cllr Brian Stephens, Cabinet member for neighbourhoods and local partnerships at Durham County Council, said: “We’re asking residents to check where their waste will end up before they hand over their cash to a man with a van. Ian Hoult, neighbourhood protection manager at Durham County Council, added: “Stopping flytipping is our main objective and we urge people to get in touch if they suspect someone is operating without the correct paperwork or if they know someone who dumps waste instead of paying to dispose of it properly. Additional CCTV cameras will be used where possible in areas where flytipping is a known problem and extra patrols with ‘stop and check’ powers will be monitoring waste carriers to ensure they have the correct licence. Dave Hunter, regional manager for Crimestoppers North East said: “This is the first time in the history of the charity Crimestoppers that we have actively been involved in tackling flytipping but the links to other aspects of organised crime are so strong that it is logical for us to be involved now. “Our anonymous reporting service is well-trusted by members of the public, with over 1.5m contacting us and not one caller having to be identified.